Bexhill Cricket Club coach Hamish Russell. Bexhill Cricket Club’s first team is finding ways of not performing, according to coach Hamish Russell. Bexhill have lost their two completed Sussex Cricket League Division Two matches so far this season and sit second-bottom of the early table as a result. Russell said: “We were always going to be slightly struggling this year because we’re not as strong as we have been in past years. “I’m concerned that we have good cricketers in our team, but we’re finding ways of not performing. Whether that be a brain explosion or an injury or a wet ball, we just seem to be finding ways of not making a real contribution. Only Matt Peters is really kicking on. Bexhill will return to The Polegrove tomorrow (Saturday) for the visit of Three Bridges. Play will start at 12.30pm. With the likes of Joe Sarro, Ollie van Noort, Neil Blatchly and Ian May expected to come in, Bexhill should be as strong as they’ve been so far this season. Bexhill coach Hamish Russell admitted the first team didn’t perform well enough with bat or ball in last weekend’s seven-wicket loss away to Ansty. The visitors posted 198-8 from their 45 overs, a total which Ansty overhauled for the loss of three wickets in the 35th over of their reply. For a report on that game click here. Russell said: “We got off to a poor start, but we got ourselves back into it fantastically. Matt Peters knows his strengths, and between him and two or three of the guys lower down, we got ourselves in a position where we had a total to bowl to. “We were 100 runs short of what we probably needed to get. There won’t be too many better wickets we play on this year and I felt 300 was what we needed, certainly when you look at how they batted. “I thought at tea we would win the game, but we didn’t bowl well enough either and we let our heads drop too easily in the field. “Chasing 200 still takes some doing, it doesn’t matter how good the wicket is, and we’ve got some good bowlers. “We didn’t do anything wrong with the bowling. We bowled too many extras, which is one thing we’ve done a lot of in all of the games, specifically the leg-side wides. “I think we were a bit slow to react to a few bits and pieces, and didn’t do anything particularly different. We looked a bit scared to change things up, we got a bit predictable and they took advantage of that. “We picked up an early wicket with a good ball and I thought if we could’ve picked up a couple more, we would’ve been favourites to win the game. 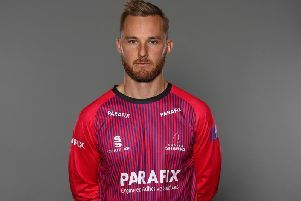 “We were doing everything we should’ve done, but they had one big over and then we dropped four catches in the next 10-15 overs, and missed a stumping, and that’s really cost us. “If we had them 50-3, that’s a big difference. We had no variation in what we tried to do and the energy seemed to go out of us very quickly.